Located on Deck 6, classic five star dining at Chops Grille on the Vision of the Seas awaits you. 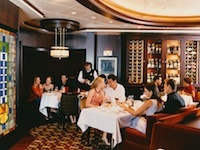 Perfect for special occasions, your wine list at Chops Grille is the best to be found on your cruise! Tuna Tartarre and crab cakes are among appetizers, and your main entree choices include Filet Mignon, a variety of cuts of steak, lamb chops, prime rib, and fish. Desserts on your menu include the Mississippi Mud Pie and Apple Pudding. The Chops Grille is one of the most popular restaurants on the Vision of the Seas, and reservations are required. It is advised that you book early as the Chops Grille will sell out. You can make reservations as soon as you board the ship, but the best way is to make them when you do online check-in well before you get on board the ship. There is a 39 USD charge per person to dine at Chops Grille. Also on Deck 6, Giovanni's Table on the Vision of the Seas provides you a nice selection of Italian treats in the tradition of Italian trattorias, the classic family restaurant. Caprese, fried calamari, and carpaccio, are among your Il primo selections. Look forward to seafood and veal as well as pasta for main entree choices, and great scenic views. Lobster and the white chocolate brulee at the Giovanni's Table are highly recommended by guests. Giovanni's Table is one of the most popular restaurants onboard Vision of the Seas, and, reservations are required. It is advised that you book early as the Giovanni's Table will sell out. You can make reservations as soon as you board the ship, however, the best way is to make them when you do online check-in well before you get on board the ship. The per person charge at Giovanni's Table is 30 USD per diner for dinner, and 15 USD per diner for lunch. The most upscale dining experience on the Vision of the Seas is without question the Chef's Table! In an intimate setting designed for 14 guests, you are surrounded by the subtle yet elegant mahogany panels as you watch your entrees being prepared by your chef! This dinner features 5 to 6 courses, each of which is matched with the perfect wine! At the end of this epicurean experience, you receive a cookbook signed by the chef. The charge per diner is 105 USD. Chef's Table is located aft on Deck 4. As one of the most elite dining experiences on the Vision of the Seas, the Chef's Table reservations book up very quickly. It's extremely important to book your reservations for the Chef's Table as soon as you can. Izumi, located forward on Deck 12, is THE place to go on the Vision of the Seas for sushi and sashimi! This specialty restaurant also offers "Hot Rock" Ishiyaki Plates and sukiyaki. Izumi is open from 12:00 PM to 1:30 PM for lunch, and from 6:00 PM to 10:00 PM for dinner. The prices at Izumi are a la carte. Expect 15 to 24 USD for entrees, and 12 to 15 USD for rolls. At Giovanni's Table, smart casual clothing is suggested. Tank tops and bare feet are not permitted. How much should I tip at the specialty restaurants on the Vision of the Seas? First, bear in mind that all alcoholic beverages that you pay for will have a gratuity added. The cover charge does include gratuity; however, you may wish to consider giving an extra gratuity to the waiter or waitress who has served you. An appropriate amount is to estimate the value of the meal you ordered if you ordered it on land and tip 15-20% based on that cost. If you feel that the value of the meal was $50 were you to order it in a land-based restaurant, you should tip $7.50-$10. It is certainly your discretion not to tip, but the waiters serving you are some of the best on the ship and should be rewarded if they provided you with an exceptional dining experience. We will e-mail when there is a change in price on this Vision of the Seas cruise. You can unsubscribe at any time.